I used the Montbell Down Hugger 900 #2 (25 degree) sleeping bag on my Calendar Year Triple Crown hike for the entirety of the Pacific Crest Trail as well as the early autumn of the Continental Divide Trail. I found it to be light, comfortable and reasonably accurate as far as rating. I sleep on the cold side, and I though the 25 degree rating was rather generous. However, as with all Montbell sleeping bags, there are 3 ratings: a comfort, lower limit, and extreme. 25 degrees was the lower limit rating on this bag, whereas the comfort rating was 34. I found that for me, the comfort rating was more like 37-40. Your results may vary. For this reason, when I transitioned to early fall I paired it with a Warm-Up Sheet. By mid-autumn I had switched to warmer bag altogether. As with all the bags in the Down hugger line, this one has spiral stretch technology in the baffling which makes it incredibly comfortable and non-restrictive—perfect for an active sleeper like me. This also makes for an overall warmer bag since it naturally conforms the bag to your body keeping the warmed air closer as well. I would highly recommend this bag to most long distance thru-hikers as an ideal 3-season sleeping bag. Benedicto.co recommends the Down Hugger 900 #2! Portland Oregon based photographer and cyclist, Daniel Sharp, recently wrote about the Down Hugger 900 #2 and its place in his bikepacking sleep system setup. Here is what he had to say, "This is a bag that is warm and extremely comfortable. It’s a bag that I can’t wait to crawl into. It’s just that comfortable." Der Montbell Downhugger zählt zu den besten Daunenschlasäcken auf dem Markt. Nylonstoffe sind in ihrer Diagonalen elastisch. Diese Eigenschaft nutzt das japanische Label Montbell für eine einzigartige, enorm aufwendige Schnittführung bei den Schlafsäcken der Downhugger-Linie. In Kombination mit den Stretchnähten, kuscheliger Daune in höchster Qualität und angenehmen Leichtmaterialien ermöglicht das einen traumhaften Schlafkomfort: Der Down-hugger macht seinem Namen alle Ehre und umschmiegt den Körper wie eine zweite Haut, lässt aber dennoch Bewegungsfreiheit zum Anwinkeln der Knie und Ellenbogen. Auch die prall gefüllte Kapuze und der Wärmekragen punkten mit bequemem Sitz, wobei sich bei Letzterem der Klettverschluss manchmal löst, wenn man sich nachts oft dreht. Der getestete Downhugger #2, mit einem Füllgewicht von 330 Gramm das leichteste Modell der Serie, empfiehlt sich für Treks vom späten Frühjahr bis Anfang Herbst und hielt kältefeste SchIäfer bis zum Gefrierpunkt warm - stark für ein nur 670 Gramm schweres Komfortmodell mit Wärmekragen. Somit geht auch der hohe Preis in Ordnung. Want to talk value? After spending some 60 nights in this bag, I've paid less than $10 per snooze for it, and it performs as well as ever. 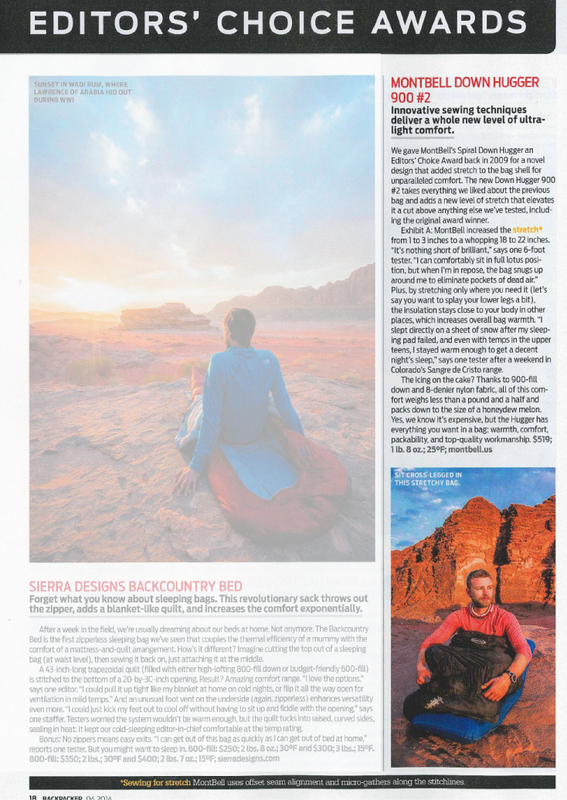 When BACKPACKER gave the Down Hugger an Editors' Choice Award in 2014, there was nothing else like it on the market. A unique combination of elastic stitching, fabric gathers, and cutting on the bias (a sewing technique where you adjust the angle of the fabric to take advantage of its natural flex) allows the bag's shoulder girth to expand to 75 inches, accommodating pretty much any sleeping position. - William M. Rochfort, Jr.
"I’m personally not a fan of narrow, constricting mummy bags, so when I was handed the Down Hugger 900 #2 I thought there was no way this bag would work for me. This is, until I zipped into it. This bag is deceptively roomy, thanks to its unique spiral baffling and stretchy stitching. That innovative construction helps eliminate cold air pockets by moving with and hugging to the body—but without feeling too cramped and clingy. This let me easily and comfortably roll from my back to my sides without getting all tangled up. This body-hugging feature (combined with its 900-fill down insulation) also makes this bag incredibly warm." 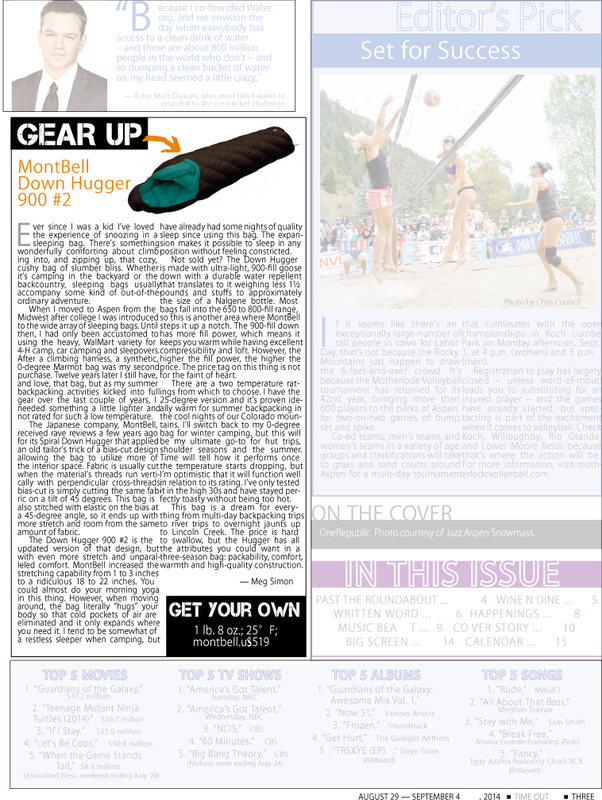 Washington Trails magazine recently reviewed the Down Hugger 900 #2 in their 2015 New Gear Guide. Here is what they had to say. 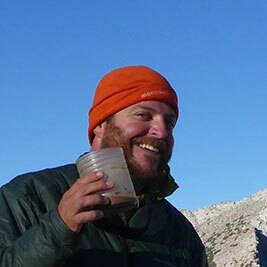 "Recently, I attended the ALDHA-West Cascade Ruck, where PCT thru-hikers gather to get information, share ideas and plan their treks. At the event, Mont-Bell was showcasing their Down Hugger bag, a 2014 Backpacker Editor's Choice award winner, and favorite bag of long-distance hikers. I had to try one. And after my own experience with it-in the chilly Northwest winter- Mont-Bell can add another feather to their cap with a WT Editor's Choice selection. Simply put, this bag is amazing. It features a stretchy spiral construction that allows you to toss, turn, curl up and roll without getting all twisted up. Then, when you settle into a comfortable position, the bag cinches in to elimnate open space and air pockets-it's like a big, warm full-body hug. Plus, a neck baffle and draft tubes minimize cold air leakage to keep you comofrtable through the night. This is the bag that will be with me on the PCT this year." Ever since I was a kid I’ve loved the experience of snoozing in a sleeping bag. There’s something wonderfully comforting about climbing into, and zipping up, that cozy, cushy bag of slumber bliss. Whether it’s camping in the backyard or the backcountry, sleeping bags usually accompany some kind of out-of-the-ordinary adventure. When I moved to Aspen from the Midwest after college I was introduced to the wide array of sleeping bags. Until then, I had only been accustomed to using the heavy, WalMart variety for 4-H camp, car camping and sleepovers. After a climbing harness, a synthetic, 0-degree Marmot bag was my second purchase. Twelve years later I still have, and love, that bag, but as my summer backpacking activities kicked into full gear over the last couple of years, I needed something a little lighter and not rated for such a low temperature. The Japanese company, MontBell, received rave reviews a few years ago for its Spiral Down Hugger that applied an old tailor’s trick of a bias-cut design allowing the bag to utilize more of the interior space. Fabric is usually cut when the material’s threads run vertically with perpendicular cross-threads; bias-cut is simply cutting the same fabric on a tilt of 45 degrees. This bag is also stitched with elastic on the bias at a 45-degree angle, so it ends up with more stretch and room from the same amount of fabric. 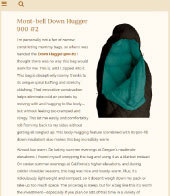 The Down Hugger 900 #2 is the updated version of that design, but with even more stretch and unparalleled comfort. MontBell increased the stretching capability from 1 to 3 inches to a ridiculous 18 to 22 inches. You could almost do your morning yoga in this thing. However, when moving around, the bag literally “hugs” your body so that cold pockets of air are eliminated and it only expands where you need it. I tend to be somewhat of a restless sleeper when camping, but have already had some nights of quality sleep since using this bag. The expansion makes it possible to sleep in any position without feeling constricted. Not sold yet? The Down Hugger is made with ultra-light, 900-fill goose down with a durable water repellent that translates to it weighing less than 1½ pounds and stuffs to approximately the size of a Nalgene bottle. Most bags fall into the 650 to 800-fill range, so this is another area where MontBell steps it up a notch. The 900-fill down has more fill power, which means it keeps you warm while having excellent compressibility and loft. However, the higher the fill power, the higher the price. The price tag on this thing is not for the faint of heart. There are a two temperature ratings from which to choose. I have the 25-degree version and it’s proven ideally warm for summer backpacking in the cool nights of our Colorado mountains. I’ll switch back to my 0-degree bag for winter camping, but this will be my ultimate go-to for hut trips, shoulder seasons and the summer. Time will tell how it performs once the temperature starts dropping, but I’m optimistic that it will function well in relation to its rating. I’ve only tested it in the high 30s and have stayed perfectly toasty without being too hot. This bag is a dream for everything from multi-day backpacking trips to river trips to overnight jaunts up to Lincoln Creek. The price is hard to swallow, but the Hugger has all the attributes you could want in a three-season bag: packability, comfort, warmth and high-quality construction. 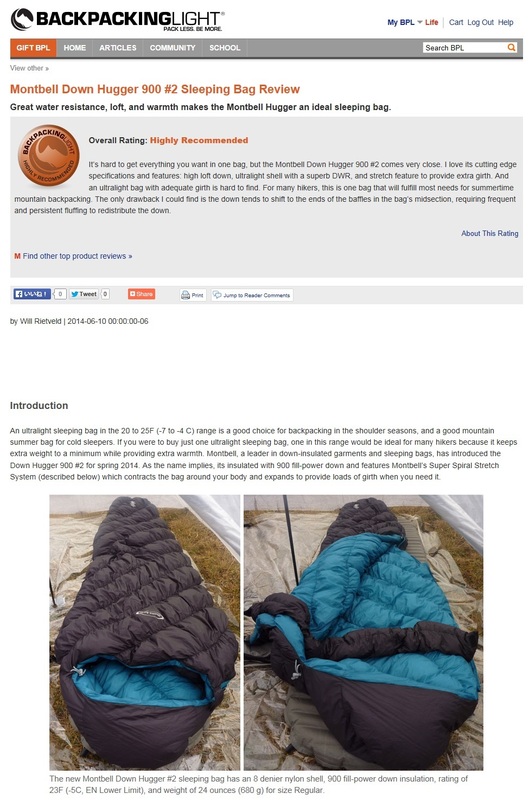 An ultralight sleeping bag in the 20 to 25F (-7 to -4 C) range is a good choice for backpacking in the shoulder seasons, and a good mountain summer bag for cold sleepers. If you were to buy just one ultralight sleeping bag, one in this range would be ideal for many hikers because it keeps extra weight to a minimum while providing extra warmth. 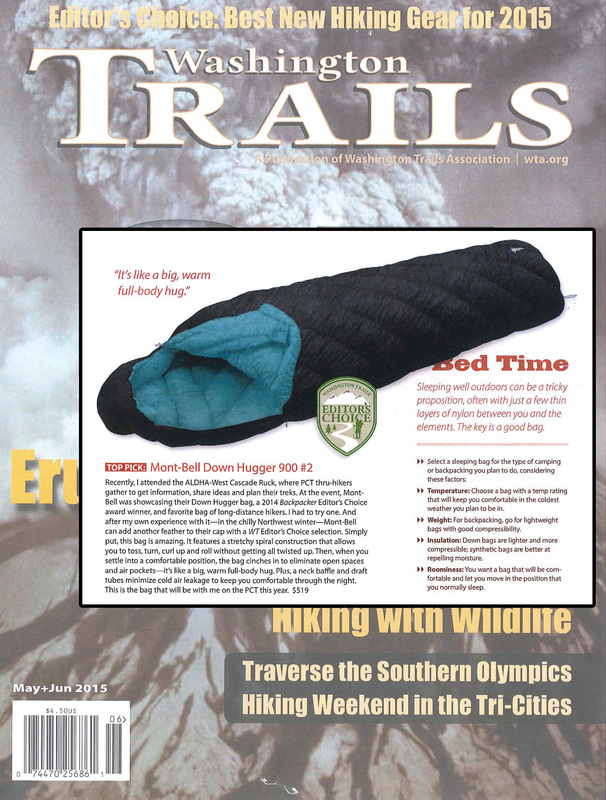 Montbell, a leader in down-insulated garments and sleeping bags, has introduced the Down Hugger 900 #2 for spring 2014. As the name implies, its insulated with 900 fill-power down and features Montbell's Super Spiral Stretch System (described below) which contracts the bag around your body and expands to provide loads of girth when you need it. Innovative sewing techniques deliver a whole new level of ultra-light comfort. We gave MontBell’s Spiral Down Hugger an Editors’ Choice Award back in 2009 for a novel design that added stretch to the bag shell for unparalleled comfort. The new down Hugger 900 #2 takes everything we liked about the previous bag and adds a new level of stretch that elevates it a cut above anything else we’ve tested, including the original award winner. Exhibit A: MontBell increased the stretch* from 1 to 3 inches to a whopping 18 to 22 inches. “It’s nothing short of brilliant,” says one 6-foot tester. “I can comfortably sit in full lotus position, but when I’m in repose, the bag snugs up around me to eliminate pockets of dead air.” Plus, by stretching only where you need it (let’s say you want to splay your lower legs a bit), the insulation stays close to your body in other places, which increases overall bag warmth. “I slept directly on a sheet of snow after my sleeping pad failed, and even with temps in the upper teens, I stayed warm enough to get a decent night’s sleep,” says one tester after a weekend in Colorado’s Sangre de Cristo range.